Rob did a perfect job as the DJ for the after party of our wedding in Bali in April. Well before our big day, Rob sent us a detailed questionnaire about the music that our guests and we liked. The songs eventually chosen buy Rob based on the questionnaire were great and brought the party alive. Thanks to Rob, we all had an amazing and memorable night. Very professional, responsive and accommodating. As were planning a million different things for our wedding, it was really important that we work with people that were honest, fair and organised. In the end, we got a ton of compliments from our guests on the DJ and music! So grateful we got to work with him. Rob was absolutely amazing! He really had our parting going all night! He was so friendly and we had great communication before our wedding I would highly recommend him to anyone! Thanks again Rob for everything. Rob you’re the man! Polite, energetic, professional and you have a real attention to details. You made our perfect night, even more perfect and truly magical. The party went off with a bang, and kept on with an indescribable energy to the very end on the dance floor! We wanted a real party, with tons of energy, smiles and dance, and that is what we got!! We would recommend you to any one. You are truly the best!! What can we say? Rob was a professional and helpful DJ to work with in the lead up to our wedding day. 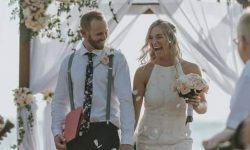 It can be sometimes difficult to liaise with people overseas, however we didn’t find any difficulty when working with Rob planning our wedding music. He was prompt with email replies and had many suggestions through his extensive wedding performances which we were comforted by. We had some idea on what we wanted but Rob really helped us with what type of music we wanted played during our ceremony and reception. He really assisted with taking the pressure off us and guiding us with our requirements. Every song we wanted played was played on time and he really got our guests up and dancing. 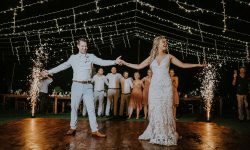 Our dance teacher had edited our wedding song and Rob was able to assist with organising this edited version with no issue and helped us make our wedding dance a success! We especially loved his traditional batik shirt that he wore!! 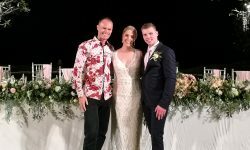 Rob, you truly cared about our special day and we would highly recommend you to anyone having their wedding in Bali. We can’t fault anything and are so happy we found you to be a part of our wedding day. Hi Rob. Firstly i want to say thank you so much for bringing the party to our wedding! Some of our favourite memories from the night are the ones we are carving up on the dance floor with our friends, family and of course each other. Your willingness to understand us and the type of music we like before the night really shows your professionalism and the lengths you go to to make sure your clients are getting exactly what they want. I would 10/10 recommend you to any brides or grooms having their dream wedding in Bali. We just want to thank Rob for DJ’ing and being an MC at our wedding. Rob was very helpful and quick to respond to our emails from the moment we enquired until our big day. All of our guests including Jay and I had an amazing night. Rob read the crowd so well. The music just kept getting better and better as the night went on. We did not want it to end. So once again, thank you! 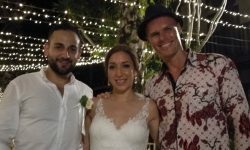 We highly recommend Rob to anyone getting married in Bali. What can we say? Rob was a professional who made planing the music for our wedding so easy. It can be difficult to liaise with people overseas, however we didn’t find any difficulty when working with Rob planning our wedding music. We gave him the list of main songs we wanted him to played and idea on what we wanted but Rob really helped us with what type of music we wanted played during our reception. Every song we wanted played was played on time and he really got our guests up and dancing. 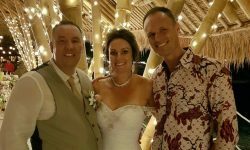 Rob truly cared about our special day and we would highly recommend him to anyone having their wedding in Bali. We can’t fault anything and are so happy we found you to be a part of our wedding day. Thank you again for all that you did you truly helped make our day so special. 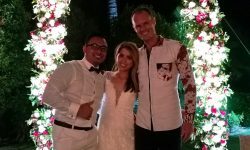 Thank you for helping us at our wedding, being a MC and DJ at the same time won’t be easy but u did so well, people are enjoying the party till drop thanks Rob! Our wedding in Bali was beautiful. Rob is the communication king. Very responsive to emails, professional in every way. Thank you DJ Rob for making the night so fun and memorable. We were so pleased with how well Rob learnt our taste in music and when it came to it he read the audience and played songs that kept us dancing all night. We would reccomend Rob to anyone thinking of planning a wedding or event. Service and communication was superb. Rob fit our brief very well, he played our guests requests and had the dance floor full from start to finish! 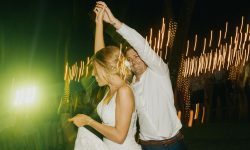 Would definitely recommend him to anyone looking for a DJ for your Bali wedding. Peter and I can’t thank you enough, the night was everything we wanted and so much more especially the array of music that was played – so thank you. Your service and communication was great prior to the event, especially as we didn’t have the ability to meet in person prior to the event. It showed us that your get to know you form we completed (with our suggestions, genres and music) was unified and taken into consideration. We felt that everything happened on time and at a smooth pace. Whilst we did feel at times the music may have not been loud enough (purely because Peter and I love music extremely loud) you were able to modify quickly and easily. All of our guests, myself and Peter absolutely loved the songs that were played and how it got everyone up and dancing; that was a huge factor for the both of us and it was definitely met so we were extremely happy with this. Overall, you met all of our expectations and more. Your professionalism, friendly and cheerful manner was fantastic and made our guests feel as though they could approach you easily for any requests they may have had. Rob you were absolutely fantastic, and we can’t thank you enough for been such a contribution to making our night the success that it was. We are more than happy for you to post the photo on any social media and would be happy to share for you. Thank you once again. All the best.